Sometimes ideas are just too obvious. It’s really a why didn’t I do that already in my life kind of thing. And this whole post is really a giant slap on your forehead. Sandwich them together when the cookie is still warm so the peanut butter cup gets all melty and sticky. Heck yezzzz. 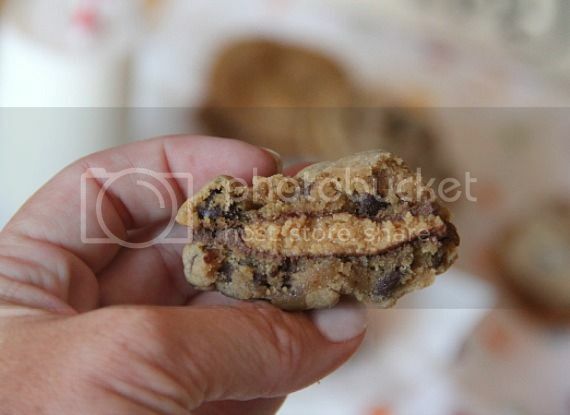 This cookie gives you permission to eat 2 cookies and a peanut butter cup in one mouthful. You’re not dreaming! She lead me to this recipe which I quickly decided needed to happen in my kitchen. It’s the most basic of concepts. I debated posting them here on my site because figured you guys might be sick of me posting 4 bagillon variations on cookie/peanut butter cup combos. I mean, you never know, right? Obviously I came to my senses though. 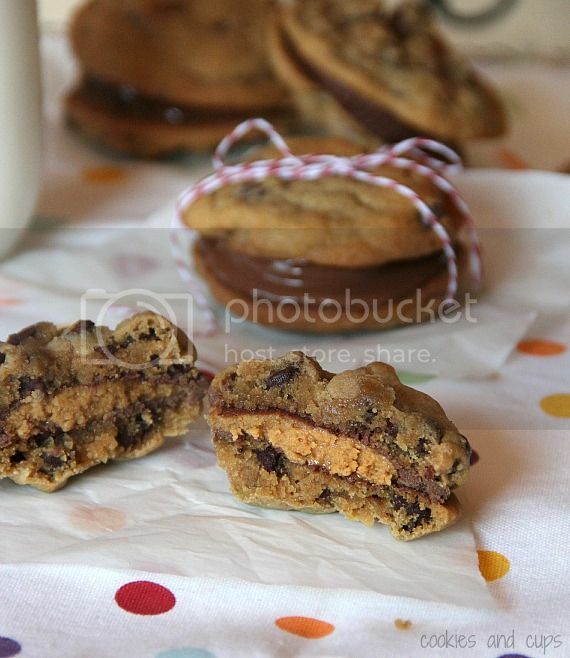 So just for your viewing pleasure, Chocolate Chip Peanut Butter Cup Cookie Sandwiches. All you gots to do is make some chocolate chip cookies. The recipe that I’m giving for these cookies is a version of my favorite chocolate chip recipe, which I have never posted here. Don’t fret, though, I will be posting about those soon…AND this version is a super delicious, quick cookie. Perfect for in-yo-face cookie stuffing. Don’t under-bake these. I mean, don’t OVER bake them either, but since I am a serial under-baker when it comes to chocolate chip cookies, just know that these need to actually BAKE…If you don’t bake them long enough the “sandwiching” process becomes a gooey, albeit delicious mess. Let the cookies cool for a few minutes so they’re not dang hot. And then loosen your pants. Cream butter and sugars together for about a minute on medium speed. Add eggs and vanilla and mix until evenly incorporated. Add salt and baking soda. 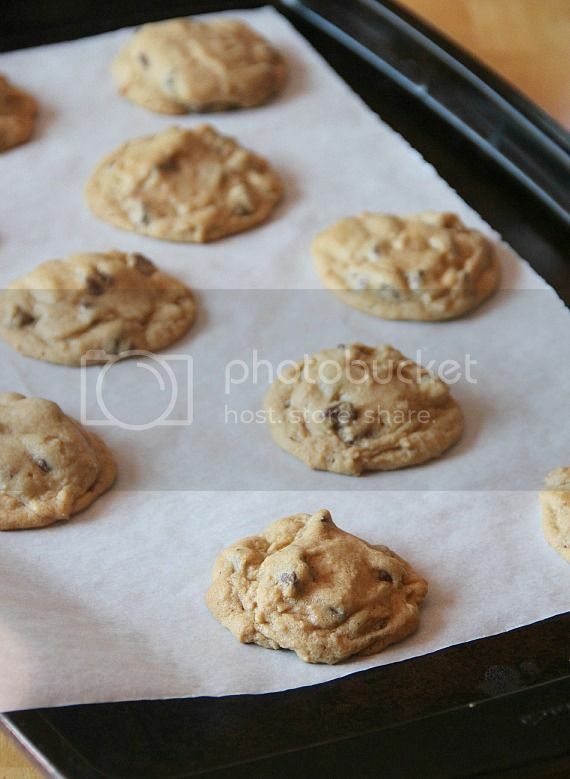 Drop cookie dough in tablespoon sized portions onto prepared baking sheet approximately 2 inches apart. Bake 8-9 minutes until edges are golden. Remove from oven and cool on baking sheet 2 minutes. Transfer to wire rack and continue cooling for another 5 minutes. 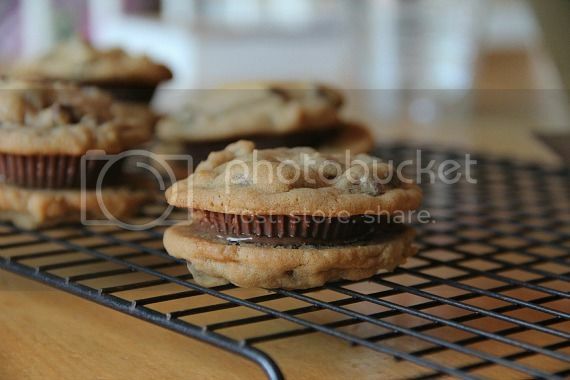 Turn half of your cookies upside down and place an unwrapped peanut butter cup on top of cookie. 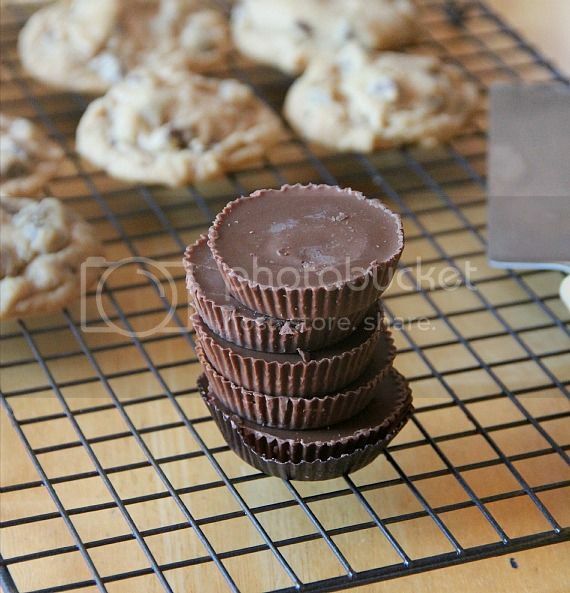 Place another equally sized cookie on top of peanut butter cup. The heat from the cookies will melt the chocolate slightly, allowing the cookies to stick to the cup. Continue cooling cookies until ready to serve. If you notice that the peanut butter cup is melting too much, place cookies in the fridge to speed up the cooling. You don’t want chocolate to drip down the side. What a combination! I’m going to make mini ones so the little boy doesn’t get crazy hyper after having one of these. The kids are going to love this, thanks! Totally simple and genius. 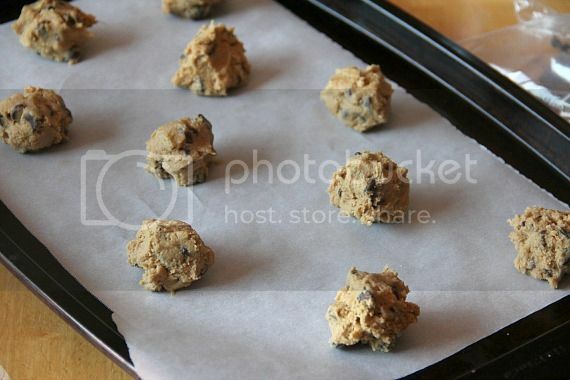 I love stuffing Reeses into the raw cookie dough before baking, but this is even easier! Oh no you di’int. I’ve been putting off baking until our a/c was fixed, which it is as of about 24 hours ago. I think I know what needs to kick off my summer baking. It’s this. And people will be lucky if I share. Real lucky. This is a great idea! I would love to know where you found the twine. I frequently see food items decorated with paper and tied with string on Pinterest but have no idea where to find either. Can you help? Thanks, Shelley! I will check there. Absolutely everything about this recipe is perfect!!!!!!! I am SO STOKED that you did this. I haven’t had time to yet. I love your adjustments to the recipe (nuking them seemed like it’d kill the cookies for future eating) and will stand by as they look equally as gooey as delicious- perhaps moreso! I think ingredients have to be bought TONIGHT. And again- you’re welcome 😉 No one can ever get too sick of these types of recipes/innovations, in my opinion! yup, that’s a “head slap” recipe! Great share! Stupid good is right, but I’m glad you’re a smartie and thought of it first. Imagine how this would be with macadamia nut cookies with white chocolate PB cups… or snickerdoodles and mallow cups! Duuuuuuuude. Me han gustado mucho, tienen muy buena pinta. La verdad es que para la operación biquini no sirven pero lo mejor de la vida es darse un gusto de vez en cuando. You’re mean and evil and bad and I want to marry you. I think I’ll take more than a dozen 🙂 Great idea & PB + chocolate = can’t go wrong! You can never have too much PB and Chocolate. Keep on, keepin on. I actually made something similar recently. YES YES YES WHAT CAN I SAY? GENIUS!! yes yes and YES. Two of m favorites in one. This is better than a pb cup stuffed chocolate chip cookie because now you get TWO cookies in one. I love how something SO simple can truly be so outstanding. Love this Shelly! I love sandwich cookies and these look absolutely amazing! I am so prepared to loosen my pants for these. I generally reserve that dessert dedication for dulce de leche, but I’ll be making an exception for these peanut butter cups. This is some insane goodness!! You make dreams come true! I will never get tired of the peanut butter and chocolate combo. Whoa. These are dangerous. I need in. Drooling here…and the packaging is so pretty! Oh. My. These look amazing!! I love you for posting this! Seems like such a no brainer but I never thought to do this!! What could be better? I just posted chocolate chip cheesecake sandwiches and I thought those were crazy good, but now I see these and I feel one-upped, haha! Never stop sharing, Shelly!! I feel like I shouldn’t call myself a choc/PB lover anymore having never thought of these! I wanted to lick the computer screen!!! I want these right now!!!!! I am going to save this to make next time. What a great idea to use the PB cup in the middle! I love it, and think that I could eat an entire batch!!! So simple but brilliant and a must try..whoa. You should seriously be arrested for these. I can’t stop thinking about them and I’m supposed to be getting lots done at work today! Help! Made them yesterday and family loved them! I might need to get new pants for these! Such a fun way to make cookies! First of all – holy cow I want one of those! And second, I will never get sick of the cookie/peanut butter cup combo. Bring them on! Something that seems so fundamental and basic, yet is absolutely the best idea I’ve seen in a while. Thanks, Shelly! OK I was wondering what size reeses cup you used. Did you use the larger size or the small size. ( I am not talking about the mini’s but the next size up). Wow ! Yes what a combination ! So yeah. I love you that much. I just made these because I saw that I printed the recipe way back in October 2013. They’re delicious!